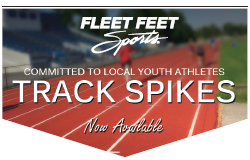 Fleet Feet Sports carries 19 different spike varieties including 12 Distance & Mid-Distance Spikes and 7 Sprint Spikes, and options for jumpers including brand new spikes from Under Armour & Hoka One One, along with adidas, Brooks, New Balance & Saucony! It is best to come in to the store early in the year for the best selection of track spikes. Program Start: Spikes available now!